Negotiation can be termed as a result-oriented discussion or conversation between two or more people with the purpose being reaching a mutually-beneficial conclusion. In most instances, the result benefits all parties, but there are times some or single member of that party carries the day. With negotiation skill, one can easily resolve differences among the participants in that discussion to achieve a beneficial outcome for the groups and individuals involved in the negotiation process. Not everyone has what it takes to negotiate beneficially; some skills are required to do this successfully. Be that as it may, virtually everyone can learn these skills. Individuals working with marketing and sales portfolio will benefit a lot from negotiation skills. It is normal for each of the customers to insist on having his or her way, but a good negotiator knows how to find a common meeting ground between the customer and the company he or she is representing. The skilful negotiator can find a mutually advantageous position for all the parties involved. The skills of negotiation are critical to all business managers and leaders; they require particular idea and strategies for negotiation since they will be at the centre of cutting deals for the organisation. Good negotiation skills are useful for business promotion and conflict resolution, which is why they are being included in leadership training programs in the business world today. The information available on negotiation is huge. However, texts like this one seek to simplify the available information as much as possible to give the reader something straight to the point and easy to understand. 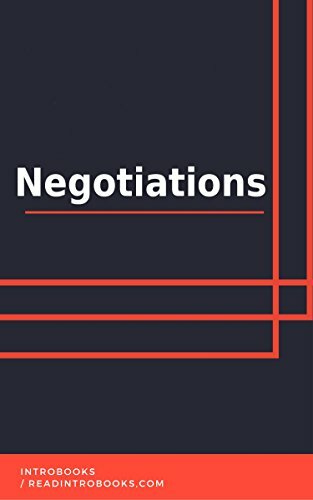 As a busy executive with limited time to spare for reading, you will find this text a handy and simplified helpmate to guide you on the intricacies and secrets of business negotiation. Being busy means an executive has limited time to study in preparation for day to day negotiations, but with the information provided here, preparing for those negotiations will be quicker and the endpoint will ensure more helpful ideas for the organisation.